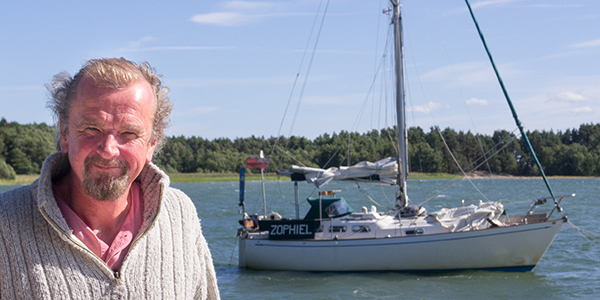 Interview with Martin Edge, skipper of Zophiel - Sail in Finland! It is my great pleasure to introduce a new guest blogger here on Sail in Finland. The guest blogger is professor Martin Edge from the UK, skipper of the Vancouver 27 sail boat Zophiel. 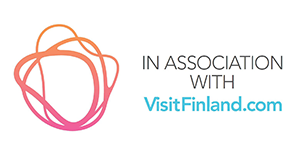 Sail in Finland (SiF): Welcome to Sail in Finland, Martin! I understand you are closing in on Finland once more? Martin Edge (ME): I arrived in Mariehamn from Sweden a couple of days ago. I’ve been sitting snug in a packed marina here rather enjoying listening to the strong wind and occasional rain outside. SiF: You have written quite a few books about your sailing adventures. How did you get involved with sailing? ME: Though I sailed a bit with my Dad and uncles as a kid, I never really took to it. It always seemed to be cold and wet and my small fingers froze as they clung onto a dinghy’s jib sheet. I only really took it up again about a decade ago. It’s a great form of adventuring for the increasingly elderly and geriatric. You can feel like a genuine explorer yet still carry about your own bed, all your favourite things you rely on now you’re set in your ways. Importantly, you’re never far from a toilet. SiF: My attention was of course caught by your book “Bobbing to the Baltic”. UK sailors are rather rare in Finland, what triggered your trip to the Baltic Sea? ME: I have sailed in Scandinavia before. I went to the Skagerrak in 2007 and to the Norwegian Lofoten Islands in 2008. But two years ago I circumnavigated Ireland. Every day I battered against the tide into a force six and a three metre Atlantic swell around the next frighteningly rocky headland, with nothing but water between me and the Americas. As I did so I dreamed, through the stinging, cold salt spray, of some magical, mythical land where there was no tide, no massive waves and thousands of sheltered anchorages, reached up perfectly sheltered channels, behind rocky islands on which three metre waves didn’t break. When I arrived home I wondered if perhaps such a place did exist in the strange and mystical lands to the east. SiF: And then you quite rightly ended up in the Baltic! The Baltic countries all have their special characteristics. How would you describe Finland with a UK sailors eyes? ME: In a word… well, in two words, the most telling feature of the Finnish attitude to sailing and the summer is ‘bare feet’. It’s symptomatic of a wholly different cultural approach to the sea than we have in the UK. I’ve had a go at explaining why in my first blogpost on Sail in Finland. SiF: Thank you, Martin! The interview at least wet my appetite for more so I think all Sail in Finland readers are just as eager as I am to read your more of your commentary on the Baltic and Finland. 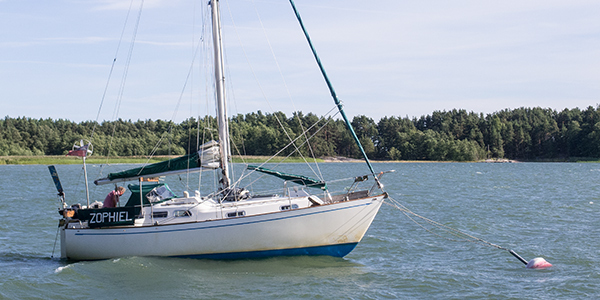 For some funny and insightful experiences into sailing in Finland, read about Martin’s Edge’s Finnish sailing experience as he slowly sails through the archipelagos of Åland and Turku. Martin has published a number of books on sailing, you can find them all on Amazon. His latest book is an extended version of the 105 Rocks, now 165 Rocks after Martin spent 2014 on the east coast of Sweden and updated the book with a number of Swedish harbors. You can buy “165 Rocks: and other stuff to tie your boat to in eastern Sweden and Finland” in paperback also on Amazon.co.uk for just £13.99 and for $27 on Amazon.com. For more information on the sailing adventures of Martin Edge and Zophiel, head over to Martin’s sailing home page here!